breaking work and dedication to saving the whales of Oceania has shown that one individual can make a difference in helping to stem the tide. Passionate educator and environmental champion she has proven this with her timely research activities in the Cook Islands. Through her efforts, the Prime Minister and the Cook Islands Parliament have declared that the entire island chain is now protected from hunting sea mammals. This declaration is much more than symbolic, as this region includes more than one million square kilometres of ocean…a vast area the size of Argentina! Follow Nan on a research journey that spans two oceans and culminates with the establishment of the first whale sanctuary in the South Pacific. 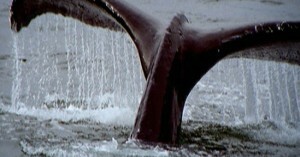 Along the way she swims with the great whales, and studies one of the rarest mammals on the planet, the Beaked Whale). She even utilizes some high tech forensic tools to challenge the US Navy on their role in the mass strandings of cetaceans in the Atlantic. Nan actively assists her research colleagues in New Zealand with groundbreaking DNA genetic work, engages in long-term field studies in the Bahamas and reaches out to school children through her many educational programs that promote science and grass roots conservation. Beaked whales (family Ziphiidae) have been around for millions and millions of years, and yet this ancient group has rarely been filmed…until now! Many of the species are truly living dinosaurs. Even today, new species of beaked whales are still being discovered! One species Indopacetus pacificus has never even been seen alive, and descriptions are based solely on skeletal remains. So little is known about their remarkable life-styles. But we do know that they are among the deepest diving of all the mammals in the sea, and possibly rival the sperm whale as the champions of the deep.